Wishing you a Safe and Joyous Christmas Season!!! Read on to hear about three great offers! The decorating is nearly complete at the Water Street Inn and our banquet and catering team is ready to help you start planning your Holiday party at the Water Street Inn. Contact Shanasi or Jeff at catering@waterstreetinn.us to get started today. Ask for the Christmas Party Special which includes a very special gift from us - matching lodging gift certificates for however much your party spends. See the catering department for details and limitations. 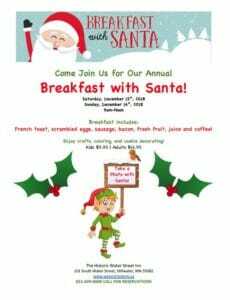 Join us for a very special breakfast with Santa on December 11 & 18. Children are invited to the annual Friends of Stillwater Parks Children’s Twinkle Parade. The Parade will be held on Saturday, December 2, 2006at the south end of Lowell Park at 4:30p.m. Kids are encouraged to create a costume to wear that will twinkle, glow, dazzle, and illuminate the evening. Participants will walk from the south end of Lowell Park to the Gazebo, culminating in the lighting of the Lowell Park holiday tree. Santa Claus will arrive to greet everyone, there will be hot cocoa, coffee, and cookies. Looking for that perfect Christmas gift or just a quick holiday get away? The Water Street Inn welcomes you to join usduring the Christmas Season. Stay in any of our Fireplace/Whirlpool suites for only $79 a night. Offer is good from December 21st through December 28th. Friday, December 8th at the Historic Washington County courthouse at 8:00pmthe Valley Chamber Chorale will give a Christmas concert with gourmet refreshments. Help kick off the holiday season with the Victorian Christmas preview gala at the Historic Washington County Courthouse located in Stillwater.